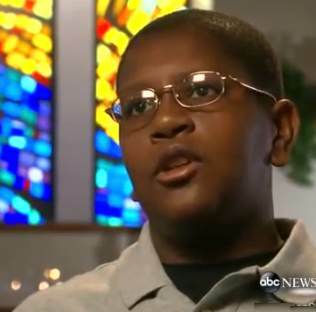 A heartbreaking story ran in the Tampa Bay Times on October 8 about a brave boy, 15, who stood up in front of a church during Sunday services to ask someone to love him. The orphan had been raised in foster care and lived in a group home for boys where the bathroom remained locked and surveillance cameras recorded everything. But when he learned his birth mother had died in June along with her long rap sheet of convictions, everything changed. The boy with four names – the last thing his parents ever gave him — Davion Navar Henry Only, realized now that he would never have a loving family if he didn’t abandon his anger. His case worker, who had believed in him and arranged for him to speak at the church told the Times, “He decided he wanted to control his behavior and show everyone who he could be.” All summer, he worked on dropping his defenses. He lost weight and earned A’s in school. Since the story with its poignant photos was published, more than 10,000 families have come forward to adopt Davion. Others wanted to mentor the boy, send him gift cards, contribute to his college fund. He was on the Today show and The View for which he flew in a plane for the first time to New York City. The latest story from the Tampa newspaper says Davion could be in a new home by Christmas. And the best part, according to the boy, is he has raised so much awareness for boys in his situation that “The Davion effect” will more than likely find forever families for some of the other boys waiting in foster care across America.